WIRED FHLL1 WIRED FREEHAND STENCILI ARTOOL stencili AEROGRAFIA - Belles Arts Ferran, S.L. With the new Long Lines Series? of Artool® Freehand Templates, you can have unlimited length to easily create very long artwork and graphics. This will save you time for achieving professional results. Size ap. : 48"x4"
You can apply WIRED? on nearly all surfaces: flat-panel artwork, motorcycle tanks, fenders and helmets (any compound curve), kewl race boats, motor homes, trailers... it's endless! 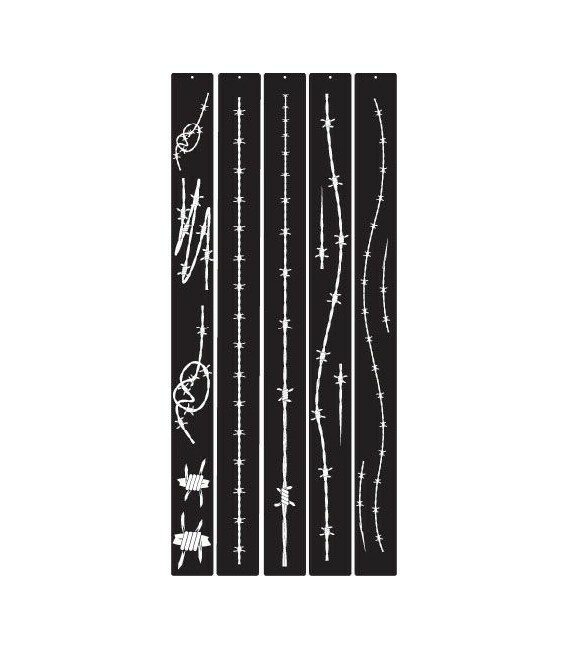 Many of the ends of the WIRED templates can be interfaced for a totally seamless transition to either the next length of barbed wire, or the knot of your choice. An effective method of adhering the Long Lines Series templates to a surface is with a low-tack spray adhesive, which you can find in any art or office supply store. You can also flip-flop any of these designs to create a variety of kewl kustom twists 'n turns. Plus, you can layer and overlap them for an interwoven barbed wire look. The large barbed wire knots can be ghosted in for some unique FX. These two larger shapes can be very dramatic for multi-layering. Fill your WIRED artwork with colors and airbrush gradations for illusions of multi-layered 3-D relief FX.